The folder containing your tutorial will be placed in the 'tutorials' folder of the p5js site. The file called index.hbs is the p5.js tutorials landing page, and the test-tutorial.hbs file is the test tutorial. tags on the page, with formatting defined by the <h1> and <h2> tags, the <p> paragraph tags as is done shown on thetest tutorial page. If your tutorial contains images, they are to be placed in the assets folder of the p5 site, in the location src/assets/learn/test-tutorial/images as shown below. Using p5js means you can illustrate your tutorial with animated, interactive or editable code examples to demonstrate programming concepts. Your examples should be prepared as p5.js sketches and can be embedded into the tutorial in two ways. If the example is to be editable like in the reference pages of the p5js site, the p5 sketch should be embedded into the html page using the p5js widget. Follow this guide on how to embed p5js sketches using the widget written by Toolness. You can also see this in action on the test tutorial page. If the example is to be animated and/or interactive but not editable. 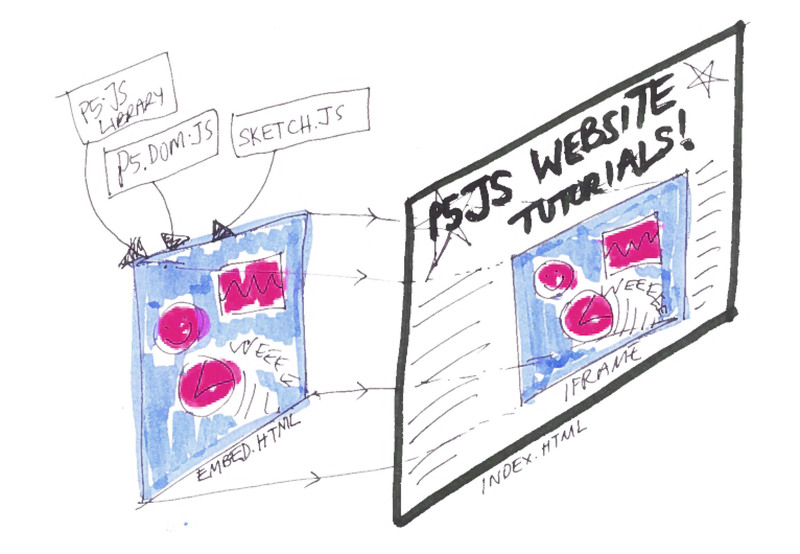 The p5.js sketch should be embedded into the page as an iframe as described below. An iframe is like creating a window through which you can see another page, sandboxed from the rest of your page. In this case it will be a window to the index.html containing your p5.js sketch. Put your p5 sketches in the /src/assets/learn folder of the site, in a folder labelled with the name of your sketch as shown in the screenshot. This is where all the images and p5 sketches linked by iframe should be stored. In the subfolders containing your p5 examples there should be a sketch.js file and the embed.html file for the sketch. Make sure your embed.html file has the correct paths to the p5 libraries of the site. If your file structure is the same as above, the path to the p5.js library should be "../../../js/p5.min.js". One thing to note is that you need to manually set the size of the iframe, so it works best if things are a standard size. Also note that the links to the p5.js library files do not happen from the .eps page with all the tutorial content. Instead they will be located in the html page that is rendering your sketch (in this case, called embed.html). More information on embedding p5.js sketches can be found here. Once your have finished writing your tutorial and your content has been given the thumbs up. Fork the p5.js website repository, prepare your content as described above and then issue a pull request to the p5.js website repository so we can publish your contribution!